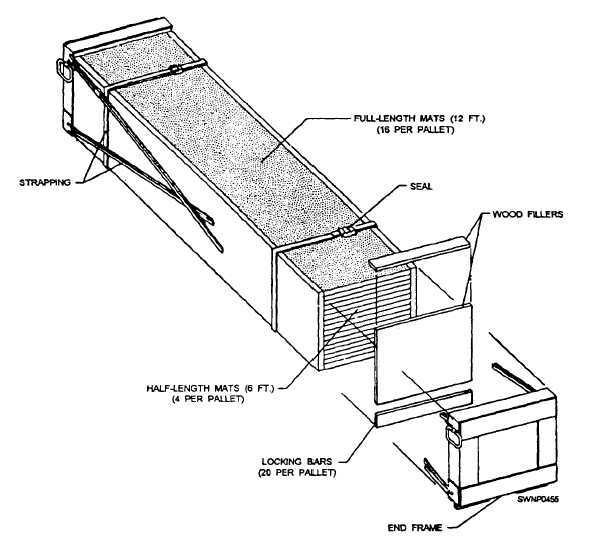 Figure 11-3.Fl5 AM-2 full-length pallet. Home > Construction Training Manuals > Steelworker Volume 02 > Figure 11-3.Fl5 Am-2 Full-Length Pallet. Figure 11-3. - Fl5 AM-2 full-length pallet. pallets by rough-terrain forklifts. This method is the most eflicient because the forklift can deliver the pallets directly to the mat-laying crews who disassemble the pallets on the forklift. Pallet disassembly is done at the work area, rather than the storage point, because the mats could be dropped and damaged while being moved if they are uncrated and moved in a loose configuration. The forklift remains on site until the pallet load has been installed. This method presumes that an adequate number of forklifts are available to resupply the laying crews continuously. Round-trip time between the work area and the pallet storage area must be considered to keep the work flowing smoothly and completed in a time] y manner. The primary rough-terrain forklift used in the NCF is the 4K rough-terrain forklift (fig. 11-4). A diesel engine-driven, self-contained, material- handling vehicle, the 4K forklift is designed primarily for the rough-terrain handling and warehousing of materials. The 4K forklift can lift and carry loads up to a maximum of 4,000-pound capacity and is the ideal equipment to use for staging pallets. The hydraulically operated forklift mechanism, mounted on the extreme front of the vehicle, eases the lifting, reaching, tilting, and sliding of loads during material-handling operations. AM-2 matting in its palletized configuration is vulnerable to damage resulting from improper handling. Lifting eyes are contained in the pallet end frames to receive the sling lifting hooks. Under NO circumstances should "choker" type of slings be used because these damage matting side connectors. Normal cargo-handling precautions must be used during AM-2 pallet assembly handling.